Starting a workout regimen can be intimidating enough without looking around the gym and feeling overwhelmed by the kettlebells, Reformers, rings, bars and climbers. Yet a growing number of fitness fans are rediscovering the basics and relying on no equipment other than their own body mass to get in shape. most reps you do is probably 20 or so. I am doing upwards of 100 reps. When Swick entered the Staples Center in Los Angeles last August at UFC on Fox 4 for his first fight in two and a half years, the crowd was on its feet. Not only has Swick been a fan favorite since appearing on the first season of The Ultimate Fighter, spectators were curious about what Swick might look like. He had battled a gauntlet of injuries and a well-publicized esophageal disorder that made it difficult for him to consume proper nutrition. 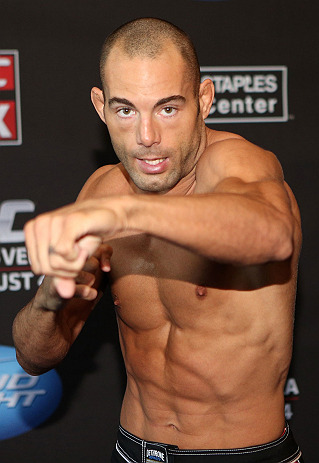 Would he be the same Mike “Quick” Swick? If anything, Swick looked better than ever. He was a ripped-to-the-bone four percent body fat with cheese-grater abs and muscles that looked strong and fast. Early in the second round Swick, crushed his opponent with a single punch and then dropped a bomb from above that had more velocity on it than Felix Baumgartner. It earned him the Knockout of the Night bonus. What is most surprising about Swick, both his chiseled-granite physique and his sonic-boom punching power, is that he doesn’t lift weights. Swick relies solely on bodyweight exercises. his own weight works best. Every day, Swick will do five sets of as many push-ups as he can do, repping out until he reaches muscular failure. He will recover for about 60 seconds and then begin his next set. Three days a week he includes five sets of max rep chin-ups. He will usually reach 35 chin-ups on his first set alone. A few other times a week he does two sets of 100 reps of body weight squats. At night, he performs neck raises using a sandbag as resistance. Despite its simplicity, it is a remarkably balanced program. When training a member at UFC Gym who is relatively new to fitness Hennebelle will often start them off with a regimen of bodyweight exercises. This not only prepares their muscles and tendons for eventually lifting heavier loads, but teaches people how to manipulate their own bodies in space, which is the basis for athleticism. For anyone who scoffs at the challenge of bodyweight exercises Henebelle has them perform what he calls a “4-2-1” push or squat: Take four seconds to lower your body, hold the bottom of the rep for two seconds, and then come up to a count of one. “It is comical to watch even the fittest person struggle with holding their body weight up for longer than it takes to do a quick rep,” says Hennebelle. For Swick, who meets Matt Brown in Seattle at UFC On FOX 5 on December 8, an added bonus to his training methods is the relatively low risk of injury. While it’s not impossible to get hurt performing push-ups and pull-ups, especially with the volume Swick does, bodyweight exercises do not inflict the type of wear and tear that lifting weights can. Even when he fought at middleweight, Swick relied on his strength in almost all of his fights. At welterweight, he feels physically dominant. His last performance, and the body he lifted to prepare for it, speaks for itself.